Des Moines-based MidAmerican Energy is number one in the nation in ownership of wind-powered electric generation among rate-regulated utilities. Around 20 percent of the company’s electric generation capacity comes from renewable resources. When a new project involving 258 new wind turbines is completed in Iowa, over a quarter of the total capacity will come from wind. The project will add around 600 megawatts to MidAmerican Energy’s generation portfolio, enough to power an additional 190,000 homes. "There hasn't been a road we've taken across the state on this whole series where we haven't driven past big long wind turbine blades being pulled by trucks," said co-host James Moore. "When you realize MidAmerican, a utility company servicing Iowa and working with Iowan manufacturing, is projecting a 25% ratio of wind in its portfolio by 2012, you get the picture of Iowa's leading role in this area. We have a great discussion with company spokesperson Tina Pothoff." 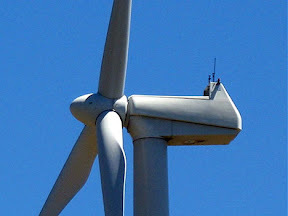 Also highlighted are two Iowa turbine manufacturing operations: Siemens with its 600,000 square foot blade manufacturing facilities in Fort Madison and Clipper Windpower of Cedar Rapids, which designs wind turbines, manufactures the 2.5 MW Liberty wind turbine, and develops wind power generating projects in the Americas and Europe. Siemens has operated its manufacturing plant for five years. It is the largest employer in Fort Madison with more than 700 people in green collar jobs at the facility.